The Dear Coco Club logo is a postage stamp. This reflects the interest in global cuisine of the founder, Rachelle Dalva Ferneau. Nailing global tastes is difficult, but doing it while keeping the chocolate dairy and gluten free is another challenge entirely. Call it a force of habit, but she has always been doing it this way. Ever since she started teaching herself the essentials of cooking food, this has been her focus. In her global pursuits she’s succeeded at making delicious chocolate while also looking out for those with sensitivities and allergies, which is truly a noble cause. A club devoted to the world traveler and even appealing to those seeking gluten-free options. Having a taste of the world is easy with this chocolate selection. Featuring chocolate bars influenced from cities around the world, expect to see flavors from Istanbul, Barcelona, and Shanghai represented. All the chocolate is made from fair trade Belgian Dark Chocolate, and they’re also made with all-natural ingredients, non-GMO’s, and no corn syrup. The best part of the selection from the Dear Coco Club is the monthly specials, which cater to worldwide and seasonal tastes. For instance in April there’s a spring selection, and in October a British collection. One of the flavors in the British collection is the Earl Gray, a popular tea named after the former Prime Minister that incorporates organic Earl Gray leaves into the recipe. With all these selections, it’s nice that the Dear Coco Club doesn’t take its’ eye off of seasonal tastes as well. As far as dairy-free and gluten-free selections go, the Dear Coco Club is in a league of its’ own. They’ve been featured in popular news outlets like VegNews, Celiathelete, and Organic Spa Magazine. As mentioned before, Dear Coco Club has freed its products from GMO’s, corn syrup, and other harmful ingredients. The company is truly a modern one. 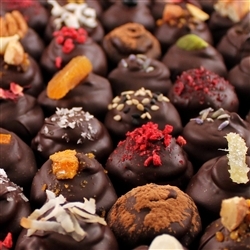 All products are made with Belgian dark chocolate, salts, herbs, teas, coffees, and roasted nuts, just to name a few. There is one chocolate club available for a period of 3, 6, or 9 months. However, those living on the west coast pay a steeper price for membership than those on the east coast. The three price points are $125, $245, $365 for 3, 6, and 9 month periods respectively. For the west coast, those prices are $155, $310, and $465. The shipping price is included in the cost of membership. Each month a member will receive a 12-piece artisan chocolate truffle collection from the Dear Coco Club with six each of the two truffle of the month flavors. Along with each regional product come ingredients typical of that actual location. For instance, the Marrakesh Apricot Anise truffle is made with the fruit and spice of that Moroccan location. It’s a nice touch, and mastering the tastes of the world takes work and flexibility. All membership holders also get a 10% discount off all the chocolate selections in store. Over the years this selection has expanded, and it now offers truffles, toffee chocolate bars, and hot chocolate spoons, all considered gourmet status. The shipping is a little complicated with the Dear Coco Club. During the first week of each month the chocolates are shipped, and if it’s going to a warm environment a cold pack is included free of charge. To ensure that both east and west coast customers receive their packages at the same time, all products are shipped via FedEx 2 day air to expedite service to west coast customers. For clarification, a west coast customer is one who lives west of Michigan, Illinois, Kentucky, Tennessee, and Mississippi. Aligning with its’ globally conscious branding, the Dear Coco Club has decided to use recyclable packaging made from post-consumer materials. For instance even the wooden spoons for the hot chocolate are made from sustainable birch, which is fully compostable and biodegradable. The only con is that membership takes a break during the summer months of June, July, and August, which explains why there isn’t a 12 month membership. If the membership is a gift, a handwritten gift card is included in the packaging for a special touch from the Dear Coco Club. Also, if a customers signs up for the membership, they receive discounts on other products in the store. Overall, Dear Coco Club has a simplistic website that makes it easy to navigate and find information. In fact, it’s so simple that it may trick you into thinking there isn’t much information there at all. But when clicking on the different products it became apparent just how detailed each globally-focused truffle or candy bar really is. Don’t let the simplicity fool you; these products are complex—in a good way! Unfortunately, picking and choosing the chocolates you want in the membership isn’t an option with the Dear Coco Club. It ships the truffles of the month and that’s it. But the good news is consumers know this going into it, and each set is a new delicious taste of the world. The Dear Coco Club offers support lines from 10 AM – 4 PM every Monday through Friday, along with a form to fill out for any written questions. This might not be needed however, because they have a FAQ page that’s extremely helpful for any common question. 3 Month East Coast Membership – Includes a monthly delivery of a 12-piece box of the truffle of the month flavors. $125 including shipping and handling. 6 Month East Coast Membership – Includes a monthly delivery of a 12-piece box of the truffle of the month flavors. $245 including shipping and handling. 9 Month East Coast Membership – Includes a monthly delivery of a 12-piece box of the truffle of the month flavors. $365 including shipping and handling. 3 Month West Coast Membership – Includes a monthly delivery of a 12-piece box of the truffle of the month flavors. $155 including shipping and handling. 6 Month West Coast Membership – Includes a monthly delivery of a 12-piece box of the truffle of the month flavors. $310 including shipping and handling. 9 Month West Coast Membership – Includes a monthly delivery of a 12-piece box of the truffle of the month flavors. $465 including shipping and handling. Their gluten and dairy-free options. It’s hard to find much wrong with the Dear Coco Club considering their efforts to make the world a better place while offering tastes from different regions. Not to mention their focus on gluten-free and dairy-free practices. Did we mention they’re vegan and kosher friendly as well? Although they have many flavors and noble pursuits, it’s still pretty evident that they’re a smaller company. The website for the Dear Coco Club is simple, but it lacks that extra touch of a professional vibe, and with the glaring differences in prices for east and west coast recipients, it’s clear that the company is still in it’s early stages. The good news is that the Dear Coco Club is a beacon for those with sensitivities that still want to get a taste of the world, which is a noble cause in and of itself. 6 Month East Coast Membership - Includes a monthly delivery of a 12-piece box of the truffle of the month flavors. $245 including shipping and handling.